Sicily is famous for its tiny black lentils, lenticchie nere. If you can’t find Italian black lentils, look for black Beluga lentils (said to resemble caviar) or European brown lentils. 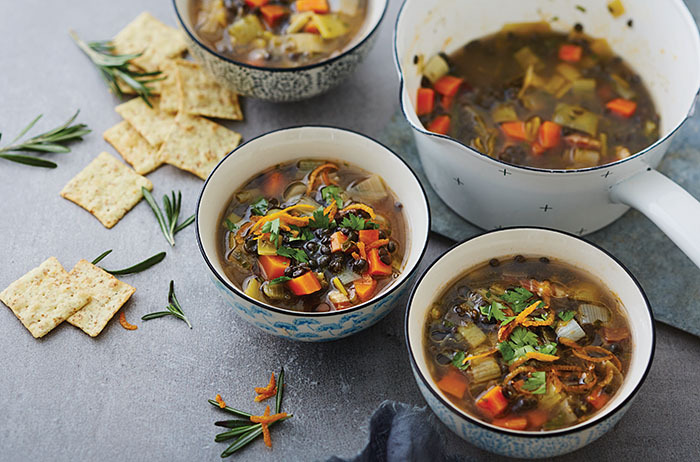 There’s no soaking involved with lentils, which means that this soup comes together in a little over an hour. Guanciale is Italian cured pork jowl or cheek. 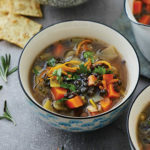 The word guancia is Italian for “cheek.” (For a vegetarian version of this soup, omit the guanciale and use vegetable broth instead of my Rich Beef-Bone Broth.) Pancetta is Italian bacon from pork belly that is cured with salt, black pepper, and spices. Serve with Red Cabbage Salad with Blue Cheese and Maple-Glazed Walnuts. 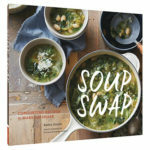 ON-DEMAND: Listen to Faith and Kathy describe how this soup comes together, as well as how to start a soup swap of your own. 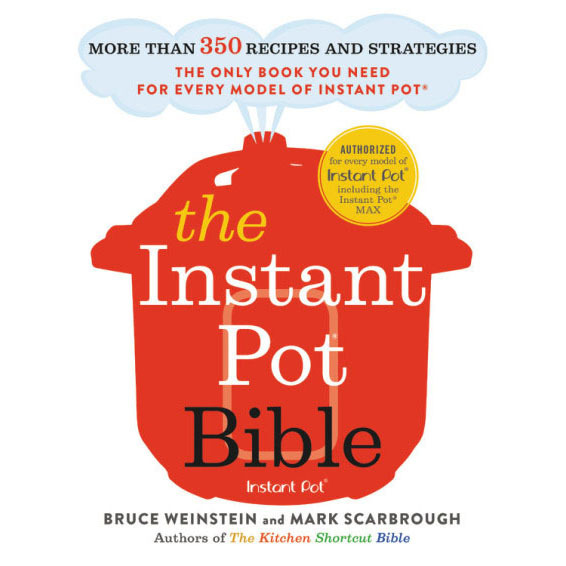 You can also support The Faith Middleton Food Schmooze® and all of WNPR’s programming by swapping a pledge of $8 a month for this book. Make your pledge now. Thanks. Trim off the dark green sections from the leeks and save for making vegetable stock. Halve the pale green and white sections lengthwise. Rinse under cold running water, pat dry, and cut crosswise into 1/2-in [12-mm] pieces. In a large stockpot over low heat, warm the olive oil. (If your guanciale is particularly fatty, cut the amount of olive oil in half.) Add the guanciale and cook, stirring frequently, for 2 minutes. Add the leeks to the pot and cook, stirring occasionally, for 6 minutes. Add the rosemary and carrots and cook for another 5 minutes. Stir in the lentils and tomato paste and continue stirring to make sure that everything is evenly coated with the tomato paste. Turn the heat to high, add the wine, and bring to a boil. Cook for 1 minute. Add the chicken stock and turn the heat to low. Add half of the parsley, season with salt and pepper, and simmer, covered, for 45 minutes to 1 hour, or until the lentils are cooked (they should be al dente, not super-soft or falling apart). Taste and adjust the seasoning, adding more salt and pepper if needed. Ladle the soup into mugs or bowls, top each with a generous sprinkling of orange zest and a sprinkling of the remaining parsley. Drizzle with orange-flavored olive oil, if desired, and serve.